This award is presented to an individual who has made an important contribution to the Association or to the profession. To receive a Meritorious Achievement Award the individual should have made either an important single contribution to the Association or the profession; or significant multiple contributions to the Association or the profession. The NASFAA Awards Nomination process is now closed. Winners will be announced this summer at the NASFAA National Conference. 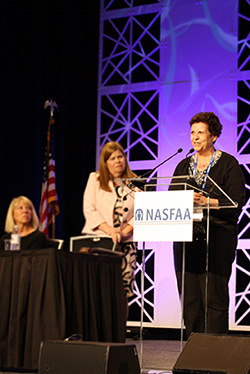 Joan Berkes retired in 2017 after more than 30 years at NASFAA making significant contributions that have played a key role in NASFAA's success and in helping schools better serve students. She began her career working in admissions and financial aid at a public four-year college in upstate New York, and joined NASFAA in 1986, as part of the Training team. Joan eventually became part of the Policy and Federal Relations team. As a former aid administrator, NASFAA trainer, and policy and advocacy expert, Joan has had a view of financial aid development, practice, and implementation that few will ever see. In a letter shared upon her retirement, National Chair Billie Jo Hamilton said: "Current and former colleagues cite you as an ‘encyclopedia' for financial aid knowledge and universally acknowledge your many contributions throughout the course of a deeply meaningful career. Your vast experience, steel-trap mind, intelligence, and wit -- with just the right amount of optimism and pragmatism -- has made you an invaluable asset to schools, to the financial aid community, and most importantly, to millions of students who have surely benefited from your work. We hold you in the highest esteem, Joan, and thank you for all you have done to further the profession and ensure better programs for the students who depend on them." Anna Griswold retired from Pennsylvania State University after 27 years of serving students there and 48 years in the financial aid profession. Under her direction, the Finaid-L listserv was created as a means for aid officers around the country to communicate with one another. Finaid-L quickly became a well-used resource for aid officers everywhere. Throughout her 48 years of service she remained active in professional organizations, serving on the COSUAA Steering Committee, the Director Loan Coalition Board, volunteering with PASFAA, EASFAA and NASFAA. Including presentations at national, regional and state conferences and as an instructor for student aid training workshops. In 2012 she served as the National Conference Chairperson for NASFAA's Chicago conference. She is a charter member of the Coalition of State University Aid Administrators and currently serves on the executive board of the Higher Education Loan Coalition that advocates for improvements in all aspects of federal loan programs. She has contributed to two white papers that have influenced improvements in federal student aid programs. At Penn State, Ms. Griswold currently holds a Faculty Senate Appointment, serves on the Financial Literacy Advisory Board and on the Governance Committee of the University's Student Information System. Roy's commitment and willingness to serve those in need in the financial aid and academic world spans over 25 years. 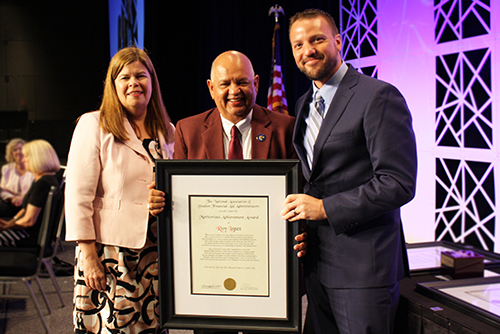 He has helped low-income students and students with disabilities succeed, and is still striving to make an impact after many years of service. Roy is the Founder and Chief Executive Officer of the annual Fiestas Patrias Mexicans event which has been in existence for 27 years. The mission of this event is to instill the beauty of the Mexican culture with its rich traditions and to promote education through cultural celebrations, the arts and scholarships for post-secondary education. Through his leadership, Fiestas Patrias has provided over $300,000 in scholarships to students with financial need. Mr. Lopez is involved in many other organizations, such as the Hernandez's Read by Third initiative which ensures students are reading at grade level by the third grade in the Bryan Independent School District. He has also written numerous articles in the La Voz Hispanic newspaper on topics related to obtaining a post-secondary education. He is always focused on helping others and is a true servant leader in the financial aid community to his colleagues and most of all, the students.